Experience the fascinating history and culture of Cuba before the island opens to general tourism. Wednesday, October 26, 2016 at 06:00p.m.–Sunday, October 30, 2016 at 11:00a.m. Imagine yourself on a rooftop terrace in Old Havana with an inquisitive and adventurous group of new Atlas Obscura friends, enjoying incredible surroundings, listening to jazz and rumba, and reflecting on Cuba's remarkable history and fascinating future. Join Atlas Obscura on a four-day adventure to Cuba, an exploration of the amazing sights and sounds of the Caribbean nation. This is a special opportunity to have an intimate, in-depth experience on the historic island before it is opened up to general tourism. Immersive History: We'll explore hidden local spots and World Heritage sites, learning about Cuba’s jigsaw history and anomalous architecture. Artist interactions: Joining artists in their studios, we'll discover Cuba's impressive and evolving art and subcultures. Music and Dancing: We will learn about uniquely Cuban musical styles, from son to rumba and jazz, through both performances and dance lessons. Religion: We'll spend time with practitioners of Cuba’s Santeria religion, learning about its African origins, its unique iconography, and its rituals. People-to-People Exchanges: Most importantly, we'll spend time socializing with local Cubans who find the U.S. as curious as Americans find Cuba! And of course we'll also enjoy unforgettable Cuban meals, cocktails, and dancing in incredible venues! A $250 non-refundable deposit is required to secure your spot as we have a very limited capacity, and we expect the trip to fill extremely quickly. The trip will cost $2,495—the $250 deposit plus $2,245 final payment—and will cover all fixed costs including a hotel, a chartered flight from Miami, accommodations in Havana, all meals, your Cuban visa, and all the activities listed below. Arrive in Miami for a briefing on your journey and an overnight rest for your morning flight. Day 2: ¡Bienvenidos a Havana! Chartered flight from Miami to Havana. Meet the Atlas Obscura private guide and enjoy expedited services to your transport, in an authentic 1950s American automobile. 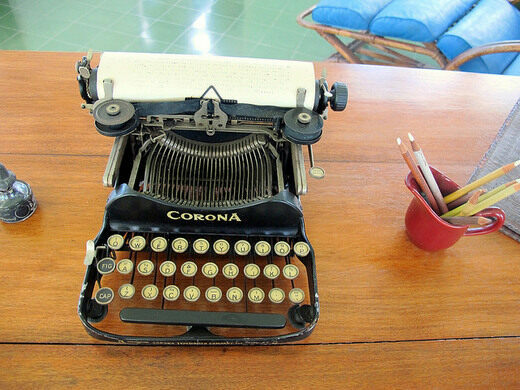 Check-in at our special Atlas Obscura casas, local bed and breakfasts run by families in the heart of Havana. Guided stroll through Old Havana, highlighting the main historic plazas: the Plaza de la Catedral, Plaza de Armas, Plaza de San Francisco and Plaza Vieja, stopping for visits with local artists and shopkeepers. Visit a local graphic arts center and speak with some of Cuba’s finest artists, who are creating some of the island's most intriguing new works while preserving traditional printmaking techniques. Waft by the Old Havana Perfume Museum, a fascinating, well-loved frivolity in the Communist country. Appreciate the impressive collection of bottles, ingredients, and historical artifacts with a fragrance expert. Private sunset cocktail hour and dinner on a rooftop in the heart of Old Havana with fellow explorers and local invited guests. 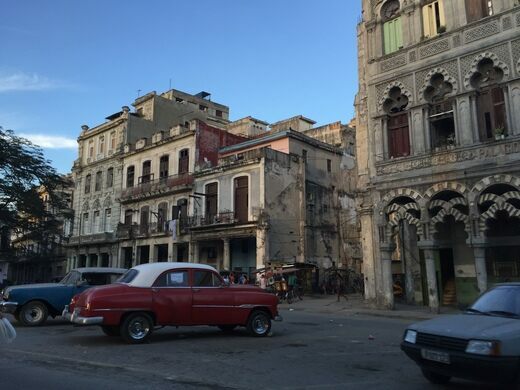 Conversation and Q&A with a local anthropologist about Cuban society. Learn Cuban salsa and dance the night away while enjoying mojitos at La Casa del Son. Private studio and home tour with the family of acclaimed Cuban muralist and ceramist José Fúster, described as the "Picasso of the Caribbean." Discuss the living artist’s public art revitalization project and stroll down village streets decorated with his mosaics en route to lunch, stopping to meet with neighborhood families along the way. 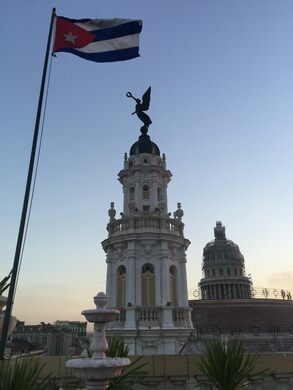 Stop by the Plaza de la Revolución to see the grand monuments honoring Cuba’s national heroes and discuss the political realities and reforms happening in the country. Visit the national monument of Necrópolis Cristóbal Colón, a cemetery once described as an “exercise in pious excesses.” Renowned for its striking religious iconography and elaborate statues, you’ll find the 56 hallowed hectares an educational stroll through the annals of Cuban history. Wander to John Lennon Park and pay homage to the artist’s bronze statue and the Beatles, once trivialized as “ideological diversionism” and later heroized as visionary by Castro himself. Talk with locals in the park about their interest in American music and culture. Dine with a Cuban professor at a family-run paladar for authentic Cuban cuisine. Take a post-meal constitutional down the Malecón, the longest promenade on the island and a social scene for Cubans. After dinner, dance and marvel at Fábrica de Arte Cubano, a power plant now converted into a massive haven for the abundant visual and performing arts community. Drive to the hilltop village of San Francisco de Paula for a private visit and cultural discussion at Ernest Hemingway’s Finca Vigía—the eclectic house where he lived for 20 years—now a museum displaying his library, manuscripts and personal effects. Near the Havana Port, visit Iglesia de Nuestra Señora de Regla to learn about the Afro-Caribbean religion of Santería from Cuba’s practitioners. Enjoy lunch with fellow explorers and learn about the layering and transference between Catholicism and African traditions. Tour a historic cigar factory from the 18th century and meet professional cigar rollers. Stop off next at the Steam Engine Museum to see rusting icons of a sugary economic history. Witness the myriad architectural styles of Havana collected over four centuries from the world’s best design on a walking tour, from the Art Nouveau-inspired National Capitol Building, to Art Deco Maxfield Parrish reliefs at the Bacardi Building, to the neo-classical Museo de la Revolucíon, once the presidential palace and decorated by Tiffany & Co. of New York. Enjoy dinner with local entrepreneurs at one of the best paladars in Havana, exclusively for Atlas Obscura. Begin your final night in Cuba with a bang at El Cañonazo, the canon firing ceremony kept from colonial times at the Fortress of San Carlos de la Cabaña, and discuss the military tradition with the soldiers. Final Farewell with our new Cuban friends at Los Jardines de la Tropical, an extravagant Spanish-style pleasure garden that fell into disrepair, now a host to concerts and dance parties. Head to Havana’s José Martí Airport, and depart to Miami. Connect in Miami to home destinations. Chartered flights between Miami and Havana. Custom Atlas Obscura luggage tags and a travel journal. 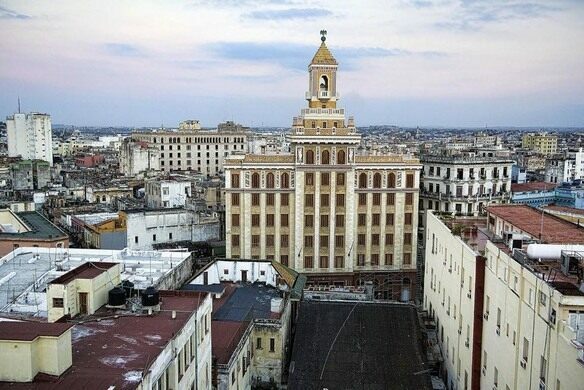 The Atlas Obscura Cuba trip is conducted in partnership with Insider Expeditions, a travel company with extensive experience designing and leading trips to Cuba and elsewhere. Please email us at cuba@atlasobscura.com with any questions about the itinerary, logistics, and payment. "I've been gushing about it since I got back, one of the best trips of my life"
"The Cuba trip was the most unique, fun, and educational experience I've had in years, and I would recommend it to anyone!" "The trip itself was a dream come true—action packed with event after event, organized as much as it could have been for Cuba. I’m so grateful to you for helping me fulfill one of my bucket list items, and for exceeding my expectations of what the trip would be!" "Can I use expletives in my testimonial? Great. It was f---ing awesome. The planners should be give a lifetime achievement award for packing in so many awesome things for a sizable group. Major props!" "This was one of the best trips I've taken in my whole entire life, and I travel quite frequently. The people, the itinerary, the coordination - it was all excellent. 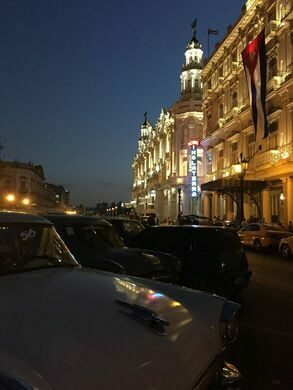 I really felt like we were having a once in a lifetime experience - making new friends, seeing new sights, and just getting to enjoy the real Cuba, not the touristy pieces." "By far the most fun I've ever had traveling with a group!" NOTE: Itineraries and pricing are subject to change. This particular tour has been designed with specific lectures and artists in mind, whose schedules and availabilities may change in coming months. If any activity or person that is advertised is missed or not available, it will be replaced with an activity or person of equal interest and value. Payment: You will be charged a non-refundable $250 deposit to hold your space. The final payment of $2,245 will be due on June 25, 2016. All reservations will be final after this date, and subject to our cancellation policy. By submitting your deposit, you agree to the Terms & Conditions. For travelers wishing to have single accommodations during the trip, an additional $299 will be included in the final payment. Transportation and flights to and from Miami International Airport.